It has been shown that media milling is a simple technique, well established on large scale for the production of nanosuspension and as can be seen from many marketed products already available in pharmaceutical industry. Media milling is also an efficient technique that has been utilized to prepare stable nanosuspensions of several drugs such as sirolimus, aprepitant, fenofibrate, megestrol acetate, morphine sulfate, methylphenidate hydrochloride, tizanidine hydrochloride and dexmethylphenidate hydrochloride. Olmesartan medoxomil (OLM) is a selective AT1 subtype angiotensin-II receptor antagonist that is approved for the treatment of hypertension. OLM dose dependently reduces blood pressure through arterial vasodilatation and reduced sodium retention, as do other angiotensin receptor blockers. It is a prodrug that is rapidly de-esterified during absorption from the gastrointestinal tract to produce an active metabolite, Olmesartan. Clinical trials in hypertensive patients revealed excellent pharmacological actions and a good tolerance without serious adverse effects. Aqueous solubility of OLM is <7.75 μg/ml. Its marketed product Benicar is available in the form of tablet. Oral bioavailability of this tablet formulation is only 26% in healthy humans due to low aqueous solubility. The unabsorbed drug leads to gastrointestinal side effects such as abdominal pain, dyspepsia, gastroenteritis and nausea. Thus, improving oral bioavailability of OLM can increase clinical efficacy, reduce the oral dose required to achieve the same effect and hence reduce the side effects. OLM was obtained as a gift sample from Cipla Ltd., Mumbai, India. Poloxamer 407 was obtained from BASF Corporation, Germany. Polyvinylpyrrolidone K-30, methanol, sodium lauryl sulfate were purchased from S.D. fine chemicals, Mumbai, India. Mannitol was obtained from Loba Chemie Pvt. Ltd., Mumbai, India. Zirconium oxide beads (smaller beads range from 0.4 to 0.7 mm diameter and that of larger beads varies from 1.2 to 1.7 mm) were obtained as gift sample from Sun Pharmaceutical Advanced Research Center, Vadodara, India, Olmesar-20 tablets were purchased from a retail pharmacy in Vadodara. Nanosuspension was prepared by media milling technique. Zirconium oxide beads were used as milling media. In 20 ml glass vial, weighed quantities of zirconium oxide beads were taken and 5 ml distilled water was added in this vial. Surfactant and drug were incorporated and comminution was carried out on magnetic stirrer for specific period of time. The prepared nanosuspension was lyophilized (Lyophilizer Lt 60e/RE2 Heto dry Winner, Denmark) using mannitol (1:5 ratio - total solid content: Mannitol) as a cryoprotectant. Briefly, to 5 ml of nanosuspension, 400 mg of Mannitol (five times the quantity of total solid content in Nanosuspension) was added as a cryoprotectant. The nanoparticulate suspension was then kept in deep-freezer for suitable time. Lyophilization was then carried out for 24 h. Initially, main power of lyophilization unit was switched on. After 15 mins, when sufficient ice was formed in the chamber, frozen samples were kept in lyophilization flask quickly such that melting of frozen sample can be prevented and attached carefully to the lyophilizer vacuum tube. Then vacuum was applied. Degassing was carried out in between to prevent explosion. Parameters that were kept constant during formulation development were: Batch volume (5 ml), vessel size (20 ml), magnetic bead size (18×6 mm), stirring speed (that gives efficient mixing of zirconium oxide beads). Various formulation variables such as concentration of drug, concentration of beads, ratio of beads and the type of surfactant were optimized in preliminary studies. In order to optimize the stirring time and surfactant concentration, a (3 2 ) full factorial design was used in which particle size (PS) and saturation solubility (SS) were selected as response parameters. Preliminary parameters were optimized by varying one parameter at a time, while keeping others constant, so that effect of varied parameters could be evaluated. Each batch was repeated thrice (n=3) for the confirmation of repeatability. The parameters were optimized to achieve minimum particle size. Optimized parameters were selection of surfactants (Poloxamer 407 and polyvinyl pyrrolidone K-30 (PVP K-30)), ratio of beads (100:0 to 0:100 of larger: Smaller beads), concentration of drug (0.4%, 0.8% and 1.2% w/v of drug), concentration of beads (60%, 80%, 100% of batch size). A 3 2 factorial design was applied for optimization of key parameters like concentration of surfactant and stirring time. Both particle size and saturation solubility, important features of nanosuspension considered to play a significant role in the formulation performance, were taken as response or dependent parameters in this study. Concentration of Poloxamer 407 and stirring time were taken as variable or independent parameters. Multiple regression analysis, contour plots and 3D response surface plots were used to study the main and interaction effects of the variables on the particle size and saturation solubility. The numbers of experiments required in factorial design studies were dependent on the number of independent variables selected and the number of levels at which they are studied. The response was measured for each trial and then either simple linear equation (1), or interactive equation (2) or quadratic (3) model was fitted by carrying out multiple regression analysis and F-statistics to identify statistically significant terms. where Y is the dependent variable (particle size or saturation solubility), while b0 is the intercept, b i (b 1 and b 2 ), b ij (b 12 ) represents the regression coefficient for the second order polynomial equation and X i represents the levels of independent formulation variables. Mathematical modeling was carried out by using equation 3 to obtain a second order polynomial equation. The PS and SS obtained at various levels of two independent variables (X1 and X2 ) were subjected to multiple regressions to yield a second order polynomial equation. The main effects of X1 and X2 represent the average result of changing one variable at a time from its low to high value. The interaction (X1X2 ) shows how the PS and SS changed when two variables were simultaneously changed. The larger the magnitude of the t value and the smaller the p value, the more significant is the corresponding coefficient. Contour plots are diagrammatic representation of the values of the response. They are helpful in explaining the relationship between independent and dependent variables. A checkpoint analysis was performed to confirm the utility of established contour plots in the preparation of OLM nanosuspension. Three values of independent variables (X1 and X2 ) were selected and corresponding values of particle size and saturation solubility were calculated by substituting the values in the reduced polynomial equation. OLM nanosuspensions were prepared experimentally by taking the amounts of the independent variables (X1 and X2 ) on the same checkpoints. Each batch was prepared three times and mean values were determined. Difference of theoretically computed values of PS and SS and the mean values of experimentally obtained PS and SS was compared by using student't' test method. Response surface plots are more helpful in understanding both the main and the interaction effects of variables. The effects of different levels of independent variables on the response parameters can also be predicted from the respective response surface plots. Mean particle size and size distribution of the prepared nanosuspension were measured using Malvern Zetasizer Nanoseries nano-ZS. Diluted nanosuspension was added to the sample cell (quartz cuvette) and put into sample holder unit and measurement was carried out with help of software. Zeta potential of the optimized formulation was measured using the same instrument. Sample was added in specialized zeta cell and the same procedure was carried out as described earlier. Approximately 1.5 ml of prepared nanosuspension was filled in 2 ml centrifugation tube and centrifuged after 24 h, using sigma centrifuge at 25000 rpm for 30 mins. Concentration of OLM in the supernatant was measured spectrophotometrically using UV-Visible spectrophotometer (Shimadzu) at 257 nm after suitable dilution with 0.05 M phosphate buffer (pH 6.8) containing 1% SLS using the same solvent as blank. Saturation solubility of plain drug was also measured in the similar manner. The X-ray diffraction pattern (XRD) studies of plain OLM powder, Poloxamer 407, and lyophilized nanosuspension formulation were carried out using X-ray diffractometer (XRD) (Brucker AXS, D8 advanced, Germany) at ERDA (Electrical Research and Development Association), Baroda, Gujarat. The Differential scanning calorimetry (DSC) thermograms of plain OLM powder, Poloxamer 407, and their physical mixture and dried nanosuspension formulation were recorded using Shimadzu DSC-60 Differential Scanning Calorimeter between 40 and 300°C at a heating rate of 10°C/min with nitrogen supplied at 40 ml/min. Transmission electron microscopy (TEM) studies were performed using Transmission Electron Microscope (PHILIPS TECHNAI-20). The liquid nanosuspension formulation was dropped on copper-gold carbon grid and allowed to dry. This grid was then mounted in the instrument and photographs were taken at various magnifications. Dissolution experiments were performed using USP 24 paddle instrument (ELECTROLAB TDT-06P). Approximately 0.05 M phosphate buffer (pH 6.8) containing 1% sodium lauryl sulfate was used as the dissolution medium. To minimize foaming of the medium during the experiment, medium was gently transferred into the dissolution vessel. Dissolution was performed at 37°C, using a paddle speed of 100 rpm. Weighed quantities of plain drug and lyophilized nanosuspension equivalent to 15 mg OLM were added to the dissolution vessels. At predetermined time intervals, 5 ml samples were withdrawn, filtered immediately through 0.1 μm PTFE syringe filter (Whatman Inc., Clifton, NJ, USA) and analyzed spectrophotometrically as described earlier. Subsequently, 5 ml of fresh medium was added to the dissolution vessel. The experiments were performed in triplicate and the mean values are reported. A 4-5 cm long portion of the dialysis tubing was made into a dialysis sac by folding and tying up one end of the tubing with thread. It was then filled up with phosphate-buffered saline pH 7.4 and examined for the leaks. The sac was then emptied and 1 ml of the plain OLM suspension, liquid nanosuspension and lyophilized nanosuspension were accurately transferred into three separate sacs which served as the donor compartments. The sacs were once again examined for leak and then suspended in the glass beakers containing 50 ml phosphate-buffered saline, which become the receptor compartment. At predetermined time intervals, 3 ml samples were withdrawn from the receptor compartment and analyzed spectrophotometrically. Fresh buffer was used to replenish the receptor compartment at each time point. The samples were withdrawn till 8 h. The study was also carried out by taking 4 mg of plain OLM suspension, liquid nanosuspension and lyophilized nanosuspension, containing drug equivalent to 4 mg and results obtained were compared. The diffusion studies and sample analysis was carried out three times each. All experiments and protocols described in this study were approved by the Institutional Animal Ethics Committee of The M. S. University of Baroda and are in accordance with the Committee for purpose of control and supervision of experiments on animals, Ministry of Social Justice and Empowerment, Government of India. Male Wistar rats (250-300 g) were sacrificed by cervical dislocation. Stomach and a part of intestine were isolated and cleaned properly. One milliliter of the liquid nanosuspension and lyophilized nanosuspension sample (4 mg/ml) was filled into the stomach/intestine which was tied at both the ends. The tissue was placed in an organ bath with continuous aeration at 37°C. The receptor compartment (organ tube) was filled with 30 ml of phosphate-buffered saline pH 7.4 with 1% sodium lauryl sulphate. At predetermined time intervals, samples were withdrawn from the receptor compartment. Fresh buffer was used to replenish the receptor compartment. The samples were analyzed spectrophotometrically for the content of OLM. The percent diffusion was calculated and plotted graphically against time. The study was also repeated with OLM suspension and marketed preparation and the results were compared. All the experiments were done in triplicate. Stability studies for nanosuspension and lyophilized nanosuspension were conducted at two different storage conditions, viz., room temperature and refrigerated conditions (2-8°C) for 3 months. Three batches, each of nanosuspension and lyophilized nanosuspension were used for each storage condition. At periodic time intervals, the samples were withdrawn and analyzed for particle size and drug content. The preliminary studies indicated that Poloxamer 407 was a surfactant of choice for the preparation of the nanosuspension. The initial size of the OLM powder suspended in water was found to be 5 μm and the PDI was 0.9. The different ratios of smaller: Larger beads were tried for nanosuspension preparation and it was observed that 100% smaller beads were most efficient in reducing the particle size to below 250 nm. The optimized concentration of drug and the beads were found to be 0.4% and 100% of the total batch size (5 ml). In order to optimize the surfactant concentration and the stirring time, a 3 2 factorial design was used. A total of nine batches of OLM nanosuspensions were prepared by media milling technique varying two independent variables, surfactant concentration (X 1 ) and stirring time (X 2 ). The composition of these nine batches, their particle size and saturation solubilities are shown in [Table 1]. A full model (Equation 1 and 2) was established after putting the values of regression coefficients in equation 3. The high values of the coefficients in both the equations indicate that both the surfactant concentration and the stirring time have profound influence on the particle size and saturation solubility. The positive values of the coefficients in equation 1 indicate that with an increase in the surfactant concentration and stirring time, there is an increase in the saturation solubility. The reason behind this is that with an increase in the surfactant concentration, there is more efficient milling leading to a smaller particle size and hence greater surface area. This is further supported by equation 2 which has negative values of coefficients indicating that particle size decreases as the concentration of the surfactant and stirring time are increased. 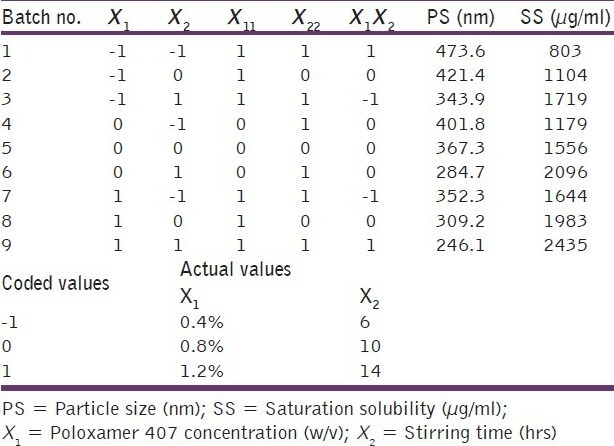 The checkpoint analysis was done and it can be seen from [Table 2] that there is no significant difference between the experimental and predicted values of saturation solubility and particle size indicating the suitability of the mathematical model for optimization of surfactant concentration and stirring time. [Figure 1]a shows the response surface plot obtained as a function of Poloxamer 407 concentrations and stirring time for PS. A decrease in PS with increase in the Poloxamer 407 concentrations and stirring time was observed. [Figure 1]b shows the response surface plot obtained as a function of Poloxamer 407 concentrations and stirring time for SS. Rise in SS was observed with increase in poloxamer concentration and stirring time. OLM nanosuspension based final formulation is intended for oral route. According to Moschwitzer the typical particle size of a nanosuspension is around 200-1000 nm. The desirable attributes for a nanosuspension are maximum saturation solubility and particles in the nanometric size range. All the prepared batches do exhibit the size in the nanometer range but batch number 9 having surfactant concentration 1.2% and stirring time 14 hours was found to have maximum saturation solubility of 2435 μg/ml and hence it was considered to be an optimized batch for further studies. Saturation solubility of optimized batch of nanosuspension and the plain drug were found to be 2435.14 μg/ml and 112.97 μg/ml, respectively. Thus, there is 21.56-fold increase in the saturation solubility of OLM when it is formulated as a nanosuspension. This great increase in saturation solubility is attributed to dual role played by the presence of surfactant and smaller particle size, especially below 1-2 μm and subsequent increase in surface area. The particle size of the lyophilized nanosuspension was found to be 259.2±2.05 nm and the PDI was 0.182±0.035 indicating that the drying conditions do not affect the size. As OLM belongs to BCS class II drug i.e. low solubility high permeability, an increase in the solubility is expected to improve the absorption and thus bioavailability. Zeta potential of the optimized batch was found to be -20.5 mV. Poloxamer 407, a non-ionic surfactant is used as a stabilizer, which provides steric stabilization. So, negative zeta potential is attributed to drug nanocrystals. In general, zeta potential value of ±20 mV is sufficient for stability of nanosuspension stabilized by steric stabilizer Poloxamer 407,  indicating that the prepared formulation would not suffer from instability problems. DSC was performed to investigate the effect of surfactant and milling on the inner structure of OLM nanosuspension. The DSC thermograms of OLM plain powder, lyophilized nanosuspension, physical mixture and Poloxamer-407 are shown in [Figure 2]. 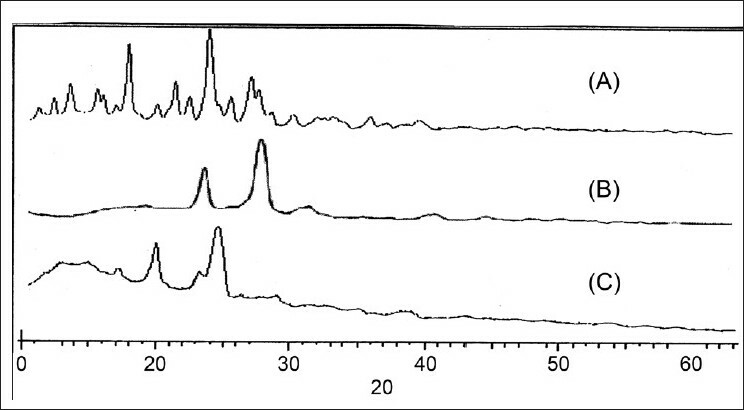 The DSC thermogram of OLM plain powder showed a sharp endothermic peak at 180°C, while poloxamer showed endothermic peak at 55°C. The physical mixture and the nanosuspension showed sharp endothermic peaks at 180°C and 55°C. This indicates that there is no interaction between Poloxamer 407 and OLM. The X-ray diffraction patterns of plain drug, formulation, Poloxamer 407 are shown in [Figure 3]. As shown in [Figure 3], there is no significant difference between the 2θ value of the plain drug and formulation. In the spectra shown in [Figure 3], it can be seen that though the intensity of the peaks is reduced, the peak pattern is not changed. From these results it can be concluded that the milling and drying process or the presence of stabilizer does not cause polymeric transition or amorphization of the drug. The drug particles still existed in the same crystalline state as the raw material. In general, crystalline substances are physically more stable compared to amorphous forms. Therefore the lyophilized nanosuspension is expected to be stable during the storage time. The improved solubility and dissolution rate is not attributed to the alterations in the crystalline state but due to reduction in the size and presence of surfactant. 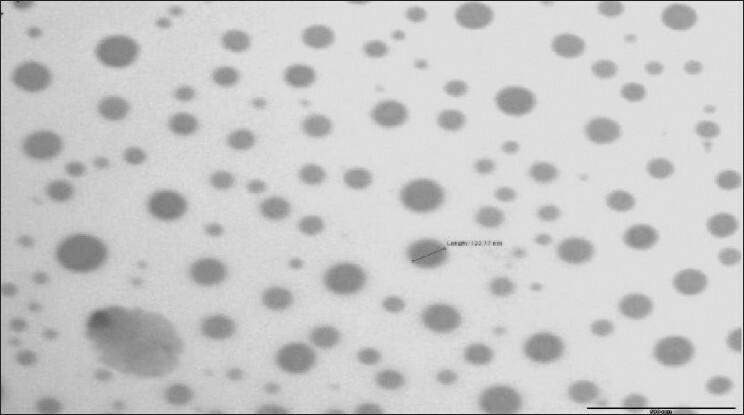 As shown in [Figure 4], which shows the image of nanosuspension obtained by transmission electron microscopy, there is no aggregation of the nanocrystals. The nanocrystals are approximately oval in shape not of uniform size as evident by the high value of polydispersivity index (PDI). 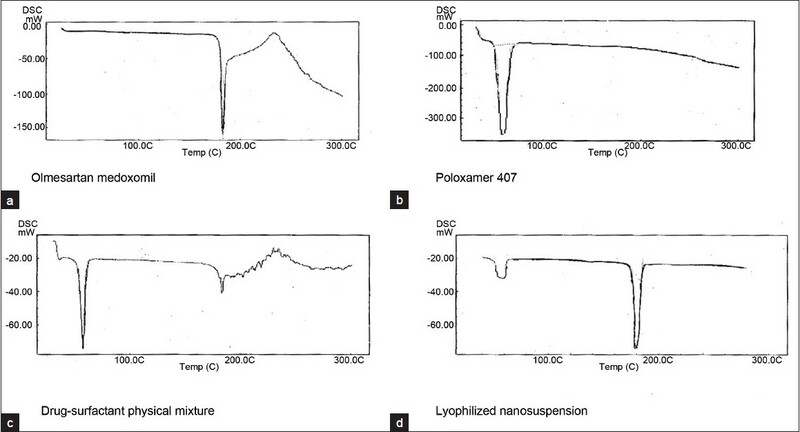 [Figure 5] shows the dissolution profile of the plain drug and lyophilized nanosuspension. 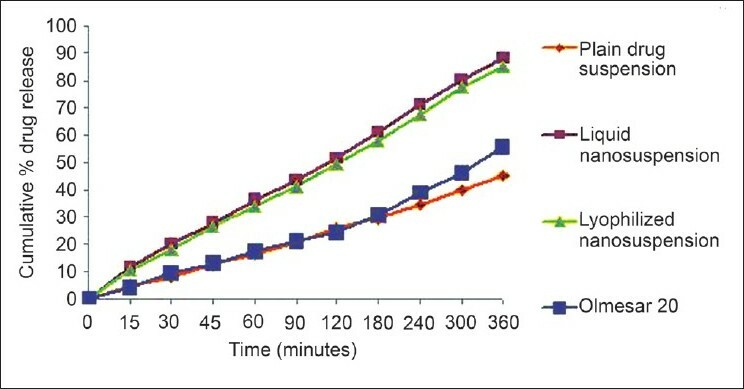 In case of lyophilized nanosuspension, more than 70% drug dissolved within 5 mins and about 100% dissolved within 15 mins, while the plain drug showed only 12% dissolution at the end of 5 mins and 92% after 60 mins. There is a significant difference between the dissolution rates of the plain drug and the nanosuspension. This drastic increase in the dissolution rate is due to the increased surface area of the drug due to smaller size and also due to presence of the surfactant. 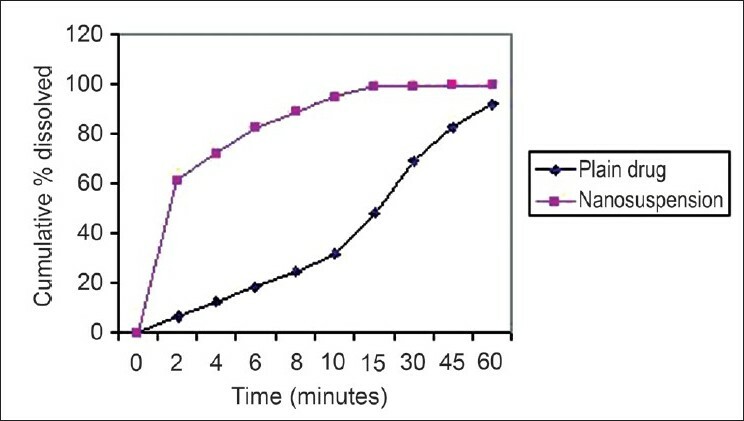 For lyophilized nanopowder, the combination of excellent disintegration properties of Mannitol and the high surface area of the OLM nanoparticles improved the dissolution profile of OLM, showing complete dissolution within minutes. According to Noyes-Whitney equation, an increase in saturation solubility and decrease in particle size lead to an increased dissolution rate. It is reported that the saturation solubility increases with decreasing particle size. However, this effect is only pronounced for particle below approximately 2 μm, especially below 1 μm  . So formulation of poorly water-soluble drugs as nanometer sized drug particles has a dramatic effect on dissolution rate, drug solubility and consequently bioavailability. The bioavailability of OLM is truly dissolution rate limited, so particle size reduction can significantly improve the performance of the drug. [Figure 6] shows the in-vitro diffusion of plain drug suspension, liquid nanosuspension and the lyophilized nanosuspension. The plain drug suspension was prepared by dispersing 20 mg of the drug in 5 ml of the distilled water. In-vitro drug diffusion profiles are strong indicators of bioavailability. Both the liquid nanosuspension and the lyophilized nanosuspension showed significantly higher diffusion than that of the OLM suspension. 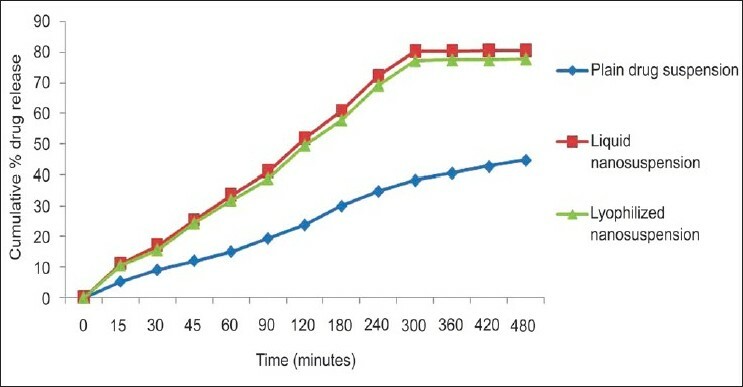 After 8 hours, 80.75% and 77.8% of the drug was diffused from the liquid nanosuspension, lyophilized nanosuspension, respectively, as compared with 43.2% diffused from the OLM suspension, indicating almost a two-fold increase in the diffusion. There was no significant difference in the diffusion rates of liquid and lyophilized nanosuspension indicating that lyophilization does not affect the diffusion pattern of the nanoparticles. The increased saturation solubility and the dissolution rate are the main factors responsible for increased diffusion rates. The in-vitro permeation study was done using stomach and intestine. The study done using stomach indicated that negligible amount of drug permeated through the stomach in 2 h.
The in vitro intestinal permeability study was carried out and the results are shown in [Figure 7]. After 6 h of diffusion, 88.31% and 85.4% of the drug was diffused from the liquid nanosuspension and lyophilized nanosuspension, respectively, while from plain drug suspension and marketed formulation, the diffusion was found to be 45.44% and 55.67%, respectively. Thus, the amount of the drug diffused through the biological membrane has doubled when it is given in the form of a nanosuspension. There was no significant difference in the drug diffusion from liquid nanosuspension and lyophilized nanosuspension. It can be clearly seen that the permeation of the drug from liquid and lyophilized nanosuspension is much faster than that from the plain drug suspension as well as the marketed formulation. The enhanced diffusion may be explained in terms of (1) the huge specific surface area of the nanosuspension droplets (mean droplet size ~246.1 nm), (2) improved permeation of the OLM because of the presence of surfactant, which reduces the interfacial tension of formulation. The results of the stability studies are shown in [Table 3]. In the case of nanosuspension stored at room temperature, the particle size increased form 246.1 to 425.6 nm in 90 days. However, under refrigerated storage conditions, there was a nominal increase from 246.1 to 299.8 nm indicating better stability under these conditions. The results showed that temperature has an influence on aggregation of nanoparticles and at room temperature, aggregation was higher compared to refrigerator condition for liquid nanosuspension. When comparing liquid nanosuspension with lyophilized nanosuspension, aggregation was more in liquid state for both conditions. Refrigerated condition has no significant effect on particle size whereas room temperature condition has more detrimental effect. The conclusion is that higher temperature results in increase in particle size. The effect is more significant in liquid nanosuspension as compared to dry formulation. The increase in the particle size at room temperature is thought to be due to the aggregation of the particles. Another reason may be the Ostwald ripening resulting from fluctuations in room temperature. The result of the chemical stability of the formulation during different storage conditions is shown in [Table 3]. It can be observed that there is no significant change in the drug content of the formulation whether liquid or dry, under any of the two storage conditions viz. room temperature or refrigerated conditions. Thus, both the liquid and lyophilized nanosuspensions are chemically stable at both the storage conditions. However, lyophilization and storage under refrigerated conditions is recommended for better physical stability. OLM nanosuspension was successfully prepared by media milling technique. This method of manufacturing was found to be simple, did not require specialized equipments and has scale-up feasibility. The nanosuspension was converted into dry powder by lyophilization in order to increase its stability. After preliminary studies, 3 2 full factorial design was applied fruitfully for optimization of formulation parameters. Saturation solubility was increased 21.56 times that of plain drug. DSC thermogram and X-ray diffractograms confirmed that the crystallinity was maintained after milling and lyophilization process. Dissolution studies indicated that the dissolution rate of the drug from the lyophilized nanosuspension is significantly higher than that of the plain drug. The in vitro drug diffusion study indicated higher diffusion from nanosuspension, possibly due to higher increase in saturation solubility and dissolution rate than plain drug. The in vitro intestinal permeability results showed that the drug diffusion across the intestinal membrane from the nanosuspension is significantly higher than the plain drug suspension and even the marketed tablet formulation. The lyophilized nanosuspension was found to be stable when stored under refrigerated conditions. These observations lead us to the conclusion that nanosuspensions seem to be a promising drug delivery system, which can provide an effective and practical solution to the problem of formulating drugs with low aqueous solubility and poor systemic bioavailability. 2. Lawrence MJ, Rees GD. Microemulsion-based media as novel drug delivery systems. Adv Drug Deliv Rev 2000;45:89-121. 3. Nakano M. Places of emulsions in drug delivery. Adv Drug Deliv Rev 2000;45:1-4. 4. Stella VJ, Rajewski RA. Cyclodextrins: Their future in drug formulation and delivery. Pharm Res 1997;14:556-67. 5. Kesisoglou F, Panmai S, Wu Y. Nanosizing-oral formulation development and biopharmaceutical evaluation. Adv Drug Deliv Rev 2007;59:631-44. 6. Kocbek P, Baumgartner S, Kristl J. Preparation and evaluation of nanosuspensions for enhancing the dissolution of poorly soluble drugs. Int J Pharm 2006;312:179-86. 7. Liversidge GG, Cundy K. Particle size reduction for improvement of oral bioavailability of hydrophobic drugs: I. Absolute oral bioavailability of nanocrystalline danazol in beagle dogs. Int J Pharm 1995;125:91-7. 8. Moschwitzer J, Muller RH. Spray coatedpellets as carrier systemformucoadhesive drug nanocrystals. Eur J Pharm Biopharm 2006;62:282-7. 9. Trotta M, Gallarate M, Carlotti ME, Morel S. Preparation of griseofulvin nanoparticles fromwater-dilutable microemulsions. Int J Pharm 2003;254:235-42. 10. Keck CM, Muller RH. Drug nanocrystals of poorly soluble drugs produced by high pressure homogenization. Eur J Pharm Biopharm 2006;62:3-16. 11. Rabinow BE. Nanosuspensions in drug delivery. Nature 2004;3:785-93. 12. Merisko-Liversidge E, Liversidge GG, Cooper ER. Nanosizing: A formulation approach for poorly-water-soluble compounds. Eur J Pharm Sci 2003;18:113-20. 13. Muller RH, Becker R, Kruss B, Peters K. Pharmaceutical nanosuspensions for medicament administration as systems with increased saturation solubility and rate of solution. United States Patent 5,858,410, USA, 1999. 14. Jacobs C, Kayser O, Muller RH. Nanosuspensions as a new approach for the formulation for the poorly soluble drug tarazepide. Int J Pharm 2000;196:161-4. 15. Warne GT, Jarvis B. Olmesartan medoxomil. Drugs 2002;62:1345-53. 16. Bruner HR, Nussberger J. Relevance of clinical pharmacological models for the evaluation of therapeutic dose range of an AT1-receptor antagonist. J Hypertens 2001;19:15-20. 17. Neutel JM, Elliott WJ, Izzo JL, Chen CL, Masonson HN. Antihypertensive efficacy of olmesartan medoxomil, a new angiotensin II receptor antagonist, as assessed by ambulatory blood pressure measurements. J Clin Hypertens 2002;5:325-31. 19. Van Eerdenbrugh B, Froyen L, Martens JA, Blaton N, Augustijns P, Brewster M, et al. Characterization of Physico-chemical properties and pharmaceutical performance of sucrose co-freeze-dried solid Nanoparticulate powders of the anti-HIV agent loviride Prepared by media milling. Int J Pharm 2007;338:198-206. 20. Bhavsar MD, Tiwari SB, Amiji MM. Formulation optimization for the nanoparticles-in-microsphere hybrid oral delivery system using factorial design. J Control Release 2006;110:422-30. 21. Armstrong NC, James KC. Pharmaceutical experimental design and interpretation. Bristol, PA, USA: Taylor and Francis Publications; 1996. p. 131-92. 22. Möschwitzer J, Achleitner G, Pomper H, Müller RH. Development of an intravenously injectable chemically stable aqueous omeprazole formulation using nanosuspension technology. Eur J Pharm Biopharm 2004;58:615-9. 23. Müller RH, Jacobs C, Kayser O. Nanosuspension as particulate drug formulations in therapy rationale for development and what we can expect for the future. Adv Drug Deliv Rev 2001;47:3-19. 24. Lindenberg M, Knopp S, Dressman JB. Classification of orally administered drugs on the World Health Organization model list of essential medicines according to the biopharmaceutics classification system. Eur J Pharm Biopharm 2004;58:265-78. El-Feky, G.S. and Zayed, G. and Farrag, A.R.H. Sutradhar, K.B. and Khatun, S. and Luna, I.P.